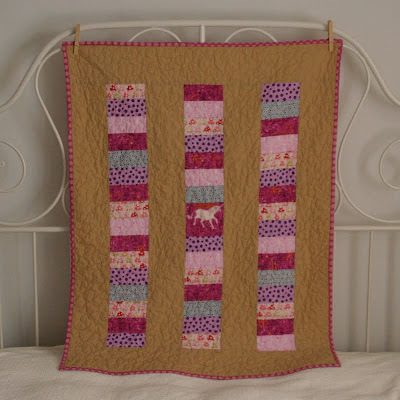 When I first learned to quilt it was by making the coin stacked pattern. The following weekend, for some reason, I went a little cutting crazy because I was so excited about my new hobby. I took all the fabric that I had and cut it up into 2.5" x 5" 'coins,' envisioning dozens of finished baby quilts shooting out of my machine. Well, that proved to be rather foolish. I now have this shopping bag stuffed with probably hundreds of these coins [I'm telling you, I cut all weekend], all hacked down to a size that is fairly limiting. It is true that I will have to make dozens of these coin stacked quilts before I use them all up. It is nice, though, to be able to reach into the bag for some coins and just start sewing without making a single cut. And I'm sure there are other patterns I can make with the pieces if I get a little creative...does anyone have any ideas? 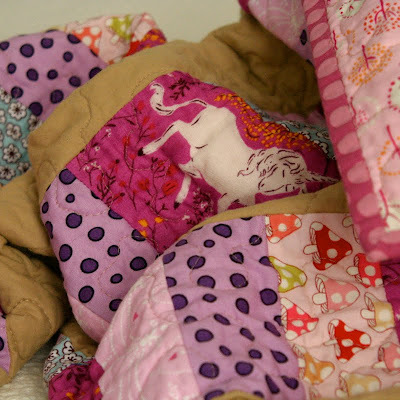 This girly unicorn quilt (Sleepy Unicorn Baby Quilt No. 36) is the latest addition to my etsy shop. Check it out here!